The OP-1: to see it is to want it. New and lust-worthy music-making hardware is all too rare these days, but as far as we can tell, Teenage Engineering's OP-1 (Operator 1) is tickling the fancy of pretty much everyone who sets eyes on it. Nodding to the past yet looking effortlessly contemporary, this is a portable synth that also works as a controller for your DAW. It has an internal battery or can be mains-powered. 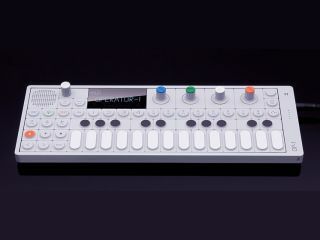 In standalone mode, the OP-1 offers eight synth models and eight samplers (FM, virtual analogue and other synthesis types are supported), plus effects, a sequencer and an arpeggiator. There's a built-in mic and speaker, and you can record to MP3. As a controller, the device delivers transport controls, four rotary encoders and 16 'quick keys'. It connects to your computer over USB 2.0, and there are minijacks for audio I/O and headphones. Slightly bafflingly, there's also a built-in FM radio. The fly in the ointment as far as the OP-1 is concerned is that we don't know if it's going to go into full production. The Teenage Engineering website (which carries more detailed specs and audio demos) states that 100 of the things will be sold to those who are willing to beta test it, and that the OP-1 will be completed in 10-12 months. No price has yet been set. There are still plenty of unknowns, then, but on paper, the OP-1 looks stunning. Time will tell if it can do the business in the flesh - and if there's sufficient demand for it to become a major success.